The Foyer Gallery is proud to display the artwork of 2017 Young at Art winner Kaitlyn Le Brun during its current group show Festivities, starting November 28, 2017. 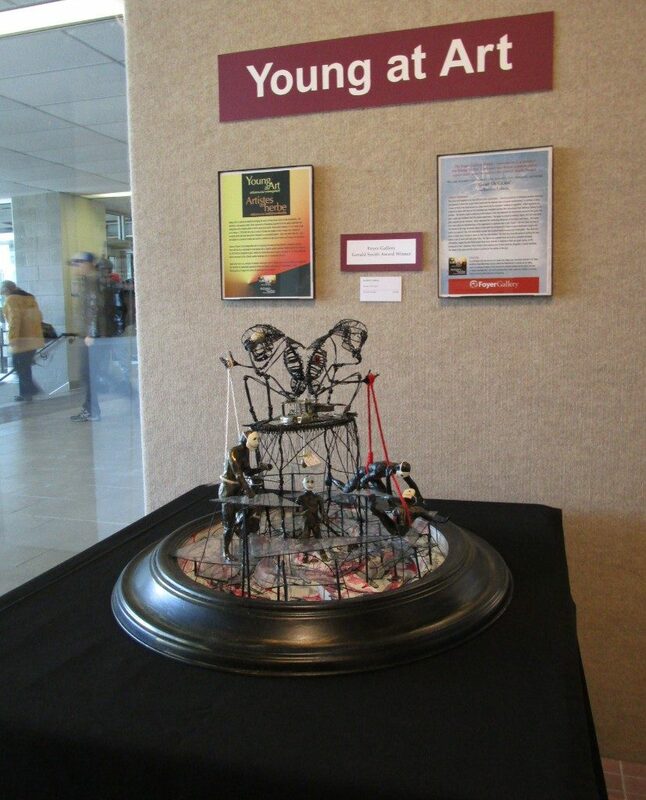 Kaitlyn’s winning artwork, ‘Game Of Glass‘, a 25″ diameter 3D mixed media, will be on display at the Foyer Gallery until January 7, 2018. Congratulations, Kaitlyn for a well-deserved prize! This piece was inspired by my own difficulty with socialization. I find the possibility of offending someone daunting, and generally retreat into myself when faced with the knotted ropes of casual conversation (I’m working on this). I chose to look at my experiences as a game based on the metaphor “walking on eggshells”, where eggshells are replaced by glass and serve as the unwritten and intangible barriers that stop people from fearlessly talking to one another. The shards of glass collecting at the bottom of the ring represent the destruction caused by the game; the pain, regret and confusion that the players experience. 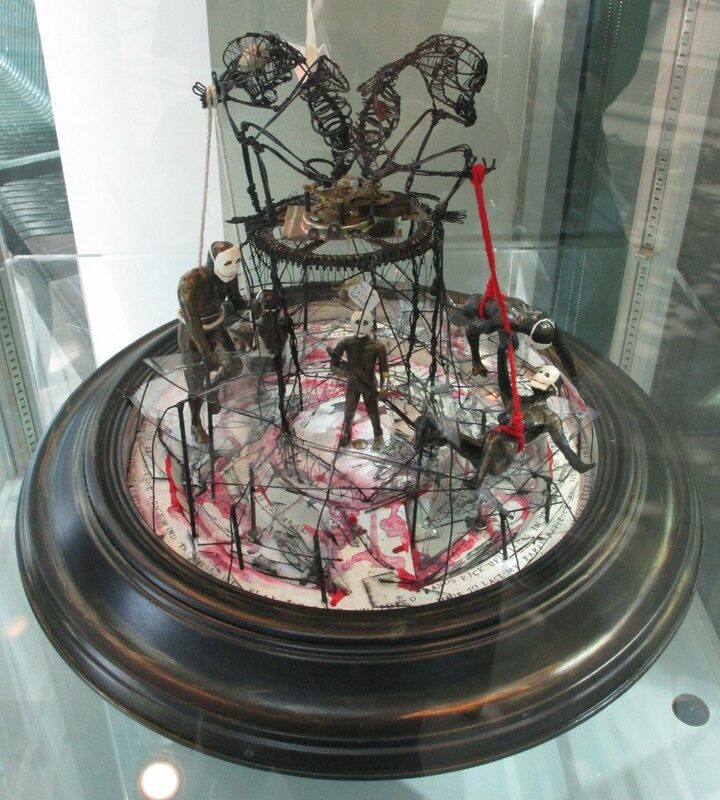 This game is played by multiple figures that are controlled (like puppets) by two “masters’’ which represent the conflicting influences of our hearts and brains.The masks are a more physical representation of the oppression of emotions due to this “glass”. The red stains pooling at the bottom of the ring represents layers of face paint that dripped off in times of great emotional struggle and had to be replaced. The child represents a player that unintentionally became part of the game. This child also wears a mask, but is forced to clean up after the other players. The child may leave the game by pulling the rope, which is out of reach until they grow taller. The figures are painted black and gold to resemble decaying silhouettes, suggesting that these people have been reduced to shadows of their pre-game selves, as the hindrance of one’s character often results in the eventual loss of that character altogether. A poem outlining the nature of the game and the players is printed on the outline of the ring. I’m a self taught artist who was born and raised in the Ottawa area. I am keenly interested in all things mechanical (especially windup clocks) as well as the theatrical arts of costume and set design. I enjoy the challenge of making art from found and re purposed materials and the added challenge of creating meaningful work. I am currently planning future artistic endeavors in addition to attending Carleton University studying Mechanical Engineering.